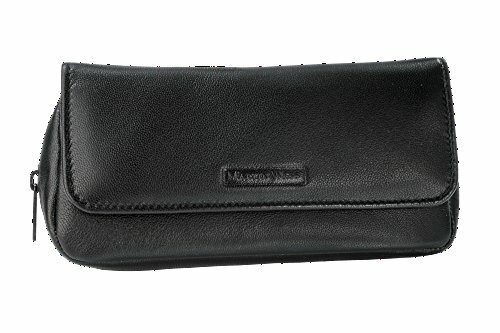 MARTIN WESS "LEA" SOFT NAPPA COMBO POUCH + PIPE CASE FOR 1 PIPE + COMPARTMENTS W 7.09" (18cm) × H 3.54" (9cm) "All Wess items are still produced our the leather factory in Offenbach. We not only guarantee an excellent quality, we also provide long term service for our hand crafted high quality goods. 1919 Bernd Kopp's grandfather, Martin Wess, founded the company which in its high time employed 100 workers and maintained a branch in New York's Fifth Avenue. The production is managed by the fine bag maker family Kurth for more than four decades. Some of our employees learned their trade in the most renowned companies of the old leather capital: Gota, Picard, Comtesse and Goldpfeilfe - just to name a few. The quality, the sophisticated functions and the high quality materials will provide the smoker long years of pleasure with our beautiful products. Available in premium tobaccoshops." !! THE VERY BEST GERMAN HAND CRAFTED QUALITY !! "The lea collection is our best seller. Classic black without any adornments, this series is a testimonial to the finest German craftsmanship. This soft lamb nappa pouch is lined with natural rubber of the highest quality. The structure of the leather is very fine and even, the seams are precise." If you have any questions about this product by Martin Wess, contact us by completing and submitting the form below. If you are looking for a specif part number, please include it with your message.